Biscotti (or contucci which is what my family calls them) have been baked for Christmas in my family since I can’t remember when. As one of our favorite treats, it simply would not be the holidays without these wonderful Italian cookies. Italian biscotti are long, narrow cookies that are hard and crispy as a result of baking them twice. Biscotti are ridiculously easy cookies to make! No one should be intimidated by the process of forming the batter into logs for the first baking, cooling them off a bit and then slicing into shape before baking a second time to become golden brown. Plus, biscotti/cantucci are easy to store for long time and versatile to experiment with different flavors. Traditionally, biscotti are dunked into either coffee or wine after dinner or as a mid-day snack. The hard texture softens in the liquid or you can eat them without dipping. My mother, grandmothers, and great-grandmothers have always made the traditional anise-flavored biscotti for the holidays. The cooks in this family rarely sway from traditional recipes when it comes to family recipes. 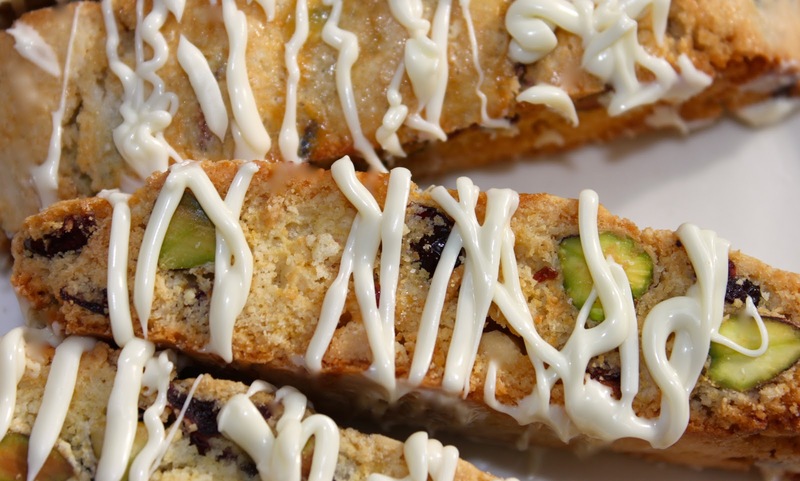 However, I’ve been wanting to bake biscotti with white chocolate, cranberries and pistachios for some time! I had an opportunity to bake up a batch of these distinctive Italian cookies when Pamela (from Orandi Ranch ARO Gourmet Pistachios sent me some pistachios from California). After receiving them I asked her if I could bake something with the nuts and post the recipe here. No one asked me to do this, I simply volunteered. These amazing pistachio-based biscotti turned out better than any of our expectations. Plus the green pistachios and red cranberries are such a beautiful combination for a holiday cookie platter. With the addition of white chocolate the cookies become more festive and special . . . creating a balance between the creamy, sweet flavor of the chocolate paired perfectly with the tart, chewy cranberries! The texture of the hard cookie base combined with the soft, creamy chocolate bits will make your taste buds sing! For an extra touch, drizzle or dip the biscotti with melted chocolate. The extra chocolate melts and adds some creamy chocolatey sweetness to your hot coffee. These biscotti are so delicious that my family has just been gobbling them down! My mother used to ask me to get them away from her to stop the constant temptation to eat more! This is one of the highest compliments when a recipe passes the rigorous test of my family and when they declare a new favorite! Your family will enthusiastically grab them up fast too, I promise! These are the most fantastic, superior biscotti that we have ever tasted! This is also a versatile recipe to change ingredients that you may prefer more. For example, if you are more fond of almonds or other nuts, use those instead. You may want to use milk chocolate or butterscotch. Maybe you prefer dried blueberries or other dried fruits instead of cranberries . . . no problem with this recipe. Or drizzle the cookies with caramel instead of chocolate too. There are so many possibilities for you to conjure up your own unique yummy flavor combination! If you prefer your biscotti more crispy for the traditional dunking in coffee or wine, the amount of baking time is anywhere from 15 – 20 minutes. The baking time for more soft cookies is 5 – 10 minutes. Just make sure that the edges of the biscotti do not brown or burn, but are golden only. so pretty displayed in a wide Santa mug! 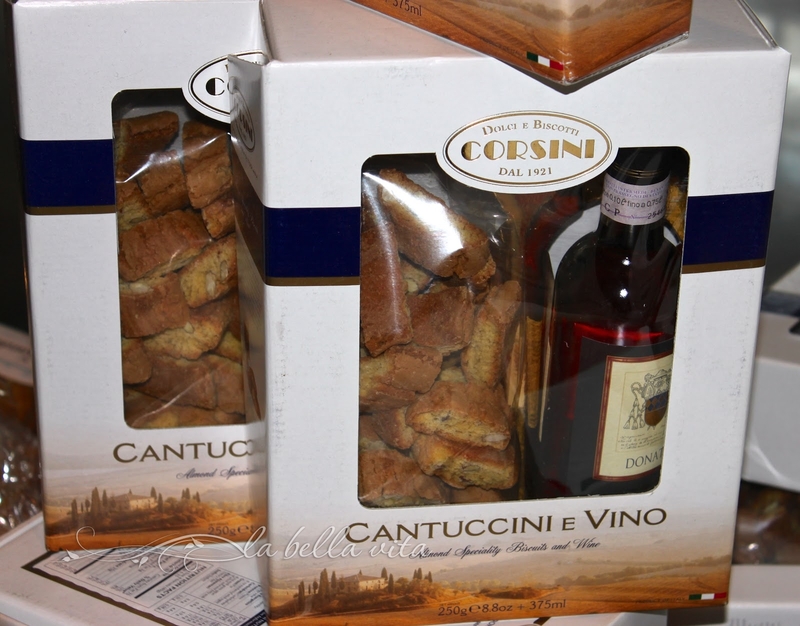 During my trip to Italy, I took these two photos of Italian “cantuccini” with wine. Many people don’t realize that Italians dip biscotti / cantucci in wine as well as coffee! “Cantucci” (as shown above) is what my family has always called biscotti. Woo! This bag of cantucci was priced at 7.60 euros . . . about $10.00 (U.S.) You can make these at home for so much less . . . and fresher too! .Disclosure: There was no compensation paid towards me for the content of this post. The recipe development was an offer that I made to create this recipe for. These look irresistible and your photos are stunning! I’ll be adding this to my biscotti repertoire. Linda, you are truly going to love these! My mother just rolls her eyes and hums with happiness each time that she bites into one! No kidding! I made this very thing for the teachers last year Ros (minus the white chocolate) but I must make it for myself WITH the white chocolate. I’ll have to try your recipe. Hi Anne, oh I hope that you do, the white chocolate with the cranberries is unbelievable! Fabulous biscotti. They look great. I bought cranberries and pistachios thinking I’d make biscotti too. (ran out of time) But now that I see yours, I am going to have to find some time. (even if I can’t do it for this month’s chocolate party) Thanks for sharing the recipe! Oh I hope you enjoy your biscotti! Have a wonderful Thanksgiving!!!!!! I can’t believe you just waved this deliciousness in front of me. Oh my. Hey Miranda! So glad to hear from you! I hope you’ve been well! Thanks for stopping by and I’ll be visiting your blog in just a moment! I wish you a very blessed Thanksgiving! Thanks so much Anne. I hope that you and your loved ones have a beautiful Thanksgiving too! I know that it will certainly be delicious! Thanks so much Liz! I wish you and your loved ones all the same, kiddo! So many things to be thankful for! Maybe you already know that biscotti means “baked twice” (bis = twice coctus= baked) and you perfectly explained the baking time. I’ve been baking biscotti for a while but have never used amaretto liqueur. So mille grazie for a new twist. And an even bigger grin on Santa’s face with the intro of amaretto. Happy Holidays to you too, Ms. Ninja!!!! These are the perfect biscuits for Christmas, Roz! The colours, the flavours…and you can eat them with a good glass of Vin Santo! I made cantuccini only twice in my life and I had mix results, but yours look very nice and crumbly maybe thanks to the cranberries and pistachios! I was reading food blogs posts when I saw your comment on my blog! Thank you very nice, I must confess that I was inspired by your Halloween Italian Style for my post Title!! Thank you Roz. Thank you so much for your wonderful, kind compliment! Oh yes, a good glass of Vin Santo sounds excellent with cantucci/ini!!!!! Roz, this looks absolutely heavenly!!! I adore biscotti, and can’t wait to start baking it for the Christmas season…it’s my favorite cookie to give as gifts! I don’t think I’ve ever seen any as pretty as yours! Happy Thanksgiving! Thank you Carol. It’s nice to have you stop by and I look forward to when you’ll post more delicious recipes on your blog someday! You’re speaking my language!! This with some tea after dinner…perfection! As they say, great minds think alike Belinda! Happy Thanksgiving! Thank you Rebecca and happy turkey day to you too! Just wanted to let you know that I’m thinking about you!! These biscotti look delicious…the perfect cookies to snack on during those more stressful moments. 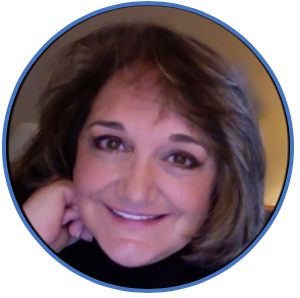 Thank you Joanne, for thinking about me and checking in! I appreciate it so much! The biscotti have totally disappeared! Thanks Maureen! It was delicious and I know that you had a yummy Turkey Day too! 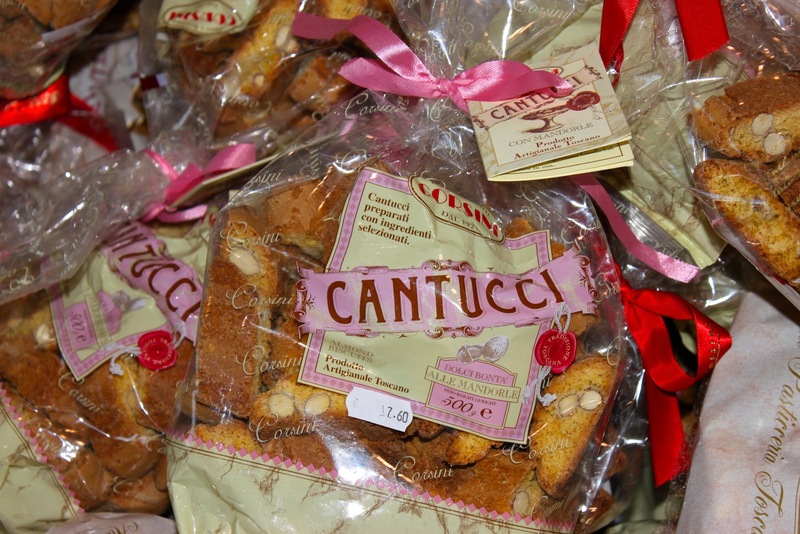 There is a place in the village which makes cantucci which are amazing! My first time having them and I was hooked. I love biscotti and my mom’s anise are the best, almost like cake, not very hard at all. This is the place http://www.ilcantuccionyc.com/ and I have reviewed it on my blog a few times. For some reason, I keep going back! Just fabulous!! Have a great weekend!! ulala! these are truly amazing. possibly the best cantucci I have seen so far. totally to try. and I loved your Italian thanksgiving post too… never celebrated that while in Italy, it is good that you managed to get hold of that tradition. herrings? so cool! Christmas and biscotti always went hand-in-hand at our house. Yours here are dressed for the occasion and I bet they’re delicious! Thanks so much chgoJohn! I’ve tried to find a link on your web-site to follow you, but couldn’t find it. Can you message me and help me so that I can follow your blog/web-site? Love the cranberry biscotti. Will make it! Oh I hope you make this recipe Barbara! You will absolutely love it! I’m positive! It would not be Christmas in my home and family without contucci — and you said the word correctly — ‘contucci’ which is how I first learned it . . . Americans embraced ‘biscotti’ for the name though. Merry Christmas and Buon Natale cara amica! oh yes please looks so good, hope your thanksgiving was wonderful. I hope that you try them someday Rebecca, although I can say that they aren’t quite in line with the healthiest of recipes such as you prepare. Maybe a treat now and then? I didn’t get the link in on time, Katherine, but will do my best to share it the next time. Merry Christmas, lady! You are so VERY KIND, Alida! Thank you so much for your visit to my blog today! I wish you a most “Buon Natale” in bella Italia! Oh Yay! These will be this year’s biscotti! So festive looking and all those flavors and those pictures have my mouthwatering already! Hi M.J., I hope that you do try these biscotti. They are especially sweet and festive for Christmas. My husband doesn’t like ‘hard’ cookies and doesn’t do what is required of them (dip them in hot chocolate or hot cocoa or a glass of wine), but loves them anyway. It’s hard to eat just one!